Helen Mirren, Keira Knightley and Mackenzie Foy star in this fantasy adventure directed by Lasse Hallström and Joe Johnston. Based on the story by E.T.A. Hoffmann, the film follows Clara (Foy), a young girl searching for a special key which will unlock a box containing a gift from her mother. 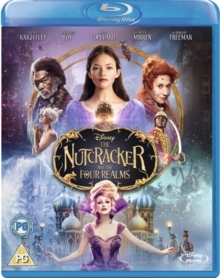 At a lavish party on Christmas Eve, Clara's godfather Drosselmeyer (Morgan Freeman) presents her with a golden thread which will lead her to the key. However, after following the thread Clara finds herself transported to a mystical land consisting of four realms where she befriends soldier Philip (Jayden Fowora-Knight) and the Sugar Plum Fairy (Knightley). After then learning that her key is being held in the dark Fourth Realm, Clara and her new friends find themselves coming up against the might of the evil dictator Mother Ginger (Mirren).